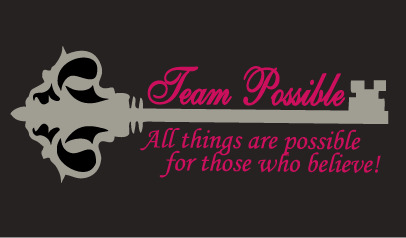 TEAM POSSIBLE 31 tees are now available to order online! PLEASE READ THE IMPORTANT ORDERING INFORMATION BELOW. Please click on the items below for full description, and to order. Logos will be all glitter prints. IMPORTANT! ORDER DEADLINE IS JUNE 27th FOR SHIPMENT BY JULY 6th. Orders will not be taken after June 27th. 1. USPS PRIORITY MAIL. These items will be mailed via USPS Priority Mail Service. This is the most economical shipping method. 2. UPS GROUND SERVICE. This option will be shipped UPS Ground Service. (Most expensive of the shipping options). DO NOT SELECT "IN-STORE PICK UP". THIS OPTION IS FOR ITEMS PICKED UP AT OUR FOWLERVILLE RETAIL LOCATION ONLY. Please note that one of the tee shirt options is a women's cut, and one is a men's cut. Please make your selection carefully. Please note that these tee shirts will be made to order and may not be returned for size exchange or for refund. Please select your size carefully. For help with sizing, there is a size chart on the information page of each t-shirt. If you have any questions about the order process, or the items offered, please contact SPORTS & APPAREL before you order.